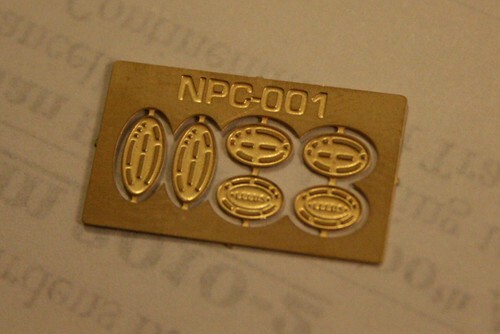 One of the spin-offs from the etching tests I did earlier in the year was a number of loco nameplates for a friend. After some further discussion I realised that there might be a bit of a gap in the market for this service in OO9 – and maybe other scales too. Although there is a supply of pre-defined plates from various sources, it seemed that if you wanted a unique name for your loco things were a bit more difficult. Having trialled this idea on the NGRM forum, I have now set up a website to capture orders for custom etched brass nameplates. The plates are being produced in batches, once a sufficient quantity of orders has been reached, and there are several “stock” styles to choose from or something more specific can be produced on request. Prices start at £4 per pair and reduce for larger quantities. There is also a standard set of 3x pairs of works plates at £3, and I have already provided individually designed works plates in Beyer-Peacock, Kitson, Planet and other styles. Other products such as number plates and spectacle frames etc are under consideration, and more suggestions are welcome. Artwork and more photographic samples are on the website, along with all the ordering details. Hopefully you’ll find it useful! This entry was posted in 009, ego trips, for sale, model railways, narrow gauge, new products. Bookmark the permalink.